I was once engaged in a conversation with a lady at Prasanthi Nilayam. 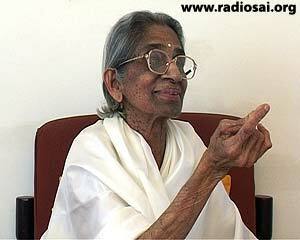 She said her reason for coming to Puttaparthi was to be healthy. However, she was very dissatisfied with what she had received. I said, “You aren’t recognizing what you are receiving here! Swami is giving you health - spiritual health!” “What do you mean?” she asked. It is delusion or what we refer to in Sanskrit as Maya or Moha. What is this illusion or attachment that Swami alludes to? It is nothing but delusion - ignorance that happiness and sadness are related to the body. It is this ignorance that Swami has come to uproot. He is an Avatara purusha (divine incarnation); He is not like other gurus. 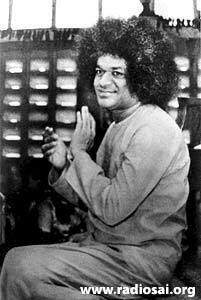 Once, Swami told a group of devotees including me, “Don't think that by coming to Puttaparthi, you are going to be very happy. You will, in fact, be very disturbed, but if you secure your victory here, you can go to any part of the world and nothing will ever disturb you." Puttaparthi is the battlefield of Kurukshetra. Lord Krishna gave the immortal message of Bhagavad Gita on the battlefield because life is a battle. And when you are victorious in battle, what do you get? Peace! Similarly, when you transcend the difficulties here with equanimity gained by the knowledge of who you really are and what the world really is, you will receive that permanent peace that I have come to give”. This is why He named it 'Prasanthi Nilayam' - the abode of everlasting peace. Many years ago, my daughter’s mother-in-law wanted to settle down in Prasanthi Nilayam. 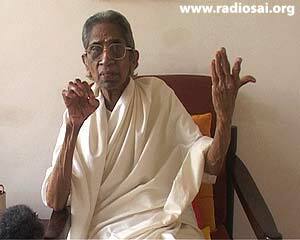 She had become a devotee only after meeting us, and in a subsequent interview with Swami, she happened to be present. 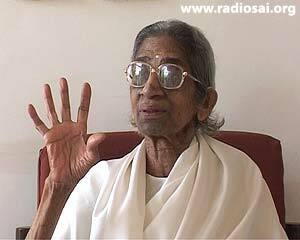 On that occasion, she expressed to Swami her wish to reside in Prasanthi Nilayam. Swami, then asked, “Why do you want to stay here? You have two sons, live with them. Who will take care of you here?” She replied, “Swami, here, I get peace”. You have come to Puttaparthi seeking that peace, so ask for that peace. But being householders, something or the other keeps bothering us now and then, and we are forced to ask Swami to help us with those difficulties. Sometimes Swami responds immediately to alleviate them, at other times He does not. However, always ask for things that conform to dharma or righteousness. Things which do not confirm to this will not be entertained by Him at all. Even in the case of desires that are within the bounds of dharma, He chooses whether the desire uplifts us or not because He is the Guru. Once in an interview, He told us that whatever good you wish for, will be granted. But He decides the right time to grant our wishes, because He knows what is good for each of us, and knows our past, future and present. In the spiritual path, patience is a key requisite, so we should patiently wait for Swami to grant us our wishes. I have a direct experience with respect to this. My husband was very reluctant to stay in Puttaparthi. He said that he could not relate to the place and wanted to leave the ashram. During one visit, at the very last moment, in the evening, I said I will not leave Puttaparthi, and if he so wishes, he could go and live with the children. I kept praying all night that it would be good for him to stay at Puttaparthi and imbibe His aura. I prayed to Swami saying that if He wanted to keep him here, He could; I completely surrendered the problem to Him. The next morning to my utter surprise, my husband said that he has decided to stay in Puttaparthi! He stayed in the ashram till his last moments. In the Bhagavad Gita, it is said that you have only the right to act and not to the result. The result is in His hands and we don’t control the result. So, the right thing to do is to leave the result to Him, so that He grants us the fruit of the action at the right moment. The message that Swami conveys is this: “When you come to Puttaparthi, you will meet many people, some good and others bad. You might get a good place to stay for one day and an uncomfortable location the next day. But all these should not affect you. You have come to the ashram for your inward journey. Do not look for peace outside. It is within you, so look within. If you think there is peace freely available in Puttaparthi, it means you have not understood the subject. This is the jnana, the knowledge that you should know." Mind, sometimes, plays tricks on us but it is also helpful in acquiring wisdom. Therefore, we must train our mind. This is what is mentioned in Karma yoga (the spiritual path of action). After mastering the mind, one can move to jnana yoga (the path of wisdom), and then to bhakthi yoga (the path of devotion). Till then our devotion is not complete. Devotion is complete only when we have wisdom. This is pointed out in the Bhagavad Gita as well. With jnana (knowledge) you must perform dhyana (meditation), and with dhyana you must develop phala tyaagam (renouncing the fruit of the action). Sometimes we may perform a good action but it could give us an unfavourable result. However, we should accept the outcome, be it good or bad. We are not engaged in work to get victory; we are working to transcend victory and defeat. God does not want to see us become sorrowful and despondent on getting an unpleasant result. On the other hand, God wants us to take the test, but not suffer. Once, in Whitefield, Swami said, “Rani Maa, I have come to awaken the inner Guru. Don't depend on the external Guru. Pray to me thus: ‘Swami, please become my inner Guru. Tell me what I should do from the inside and I will do it.’ Then I will surely guide from within you.” There should be no ‘me’ and ‘my’. It should become Swami's completely. As soon as the feelings of ‘I’ and ‘mine’ arise, we enter the realm of ignorance in that instant. Swami says, “There are to be no likes and dislikes. The duo of raga-dwesha (anger and hatred) should be transcended.” Irrespective of whether someone is lovable or not, we must love everyone. 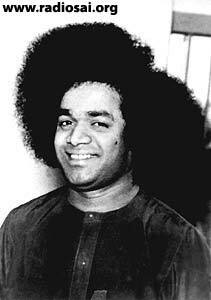 We should understand that one is acting ignorantly because of their body consciousness, and therefore, take pity on him/her as the person has not yet understood the atma (spirit) principle. We must have compassion and pray for such people. We should understand that Swami is the indweller of every being, and therefore not hurt anyone. Only then can one say that he or she understands Swami, and not until then. We should not compare and judge people. By doing so, we are buying sorrow. When we take that path even Swami will not help us because we are taking the wrong path. Once, when I said to Him “Swami, I want to be a good devotee”, He said, “It is very simple, all that you need to do is to obey Me. No books or scriptures can help. Only the Guru can take you through the spiritual path.” Obedience to the Guru is a very important trait in a spiritual aspirant. This can take a person very high. It should not be such that in some matters we obey Swami, and in others we take our own decisions. Surrender to Swami must be complete. He has promised us liberation if we practice this kind of surrender. Liberation is nothing but freedom from our body consciousness and ego. The feelings of ‘I’ and ‘mine’ constitute the ego. Two years after Swami moved to Prasanthi Nilayam, we were still in the Old Mandir and used to come to Prasanthi Nilayam for bhajans. On one occasion, during the bhajan session, He asked us to stop singing. I was sitting very close to Him. Looking at me, Swami asked, “Do you sing?” I replied in the affirmative, and added that I did not know Carnatic music and can sing only Hindustani. 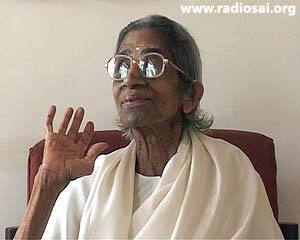 I was of the view that He liked only Thyagaraja kirtanas (based on Carnatic music) and the like. But He said, “It doesn't matter, you sing a bhajan.” So I began to sing a bhajan that came to my mind at that moment. I didn't realize it then, but later, while ruminating on it, I realized that Swami wanted me to take a great and profound lesson out of that bhajan. The meaning of that bhajan stressed on the Adwaita (non-dualistic) principle, which is what Swami wanted to point out to me. The next day when I went, Swami wanted me to sing the same bhajan again. The third day was no different. I was getting a bit frustrated of singing the same bhajan because I was not paying heed to the meaning. 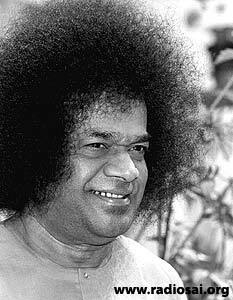 So I asked Swami in front of everyone, “Swami, I know many bhajans, shall I sing another one?” He said, “No need! I want you to sing this bhajan alone.” We can never understand Him of our own accord. He has to reveal Himself to us. Trying to understand Him is like counting the grains of sand on the beach. After a few days, He called a few ladies upstairs to clean His room. About five of us went up and while I was busy cleaning, I heard Him sing, “Raama Naama Japanaaree...,” the same bhajan that He had asked me to sing a few days ago. I was a bit surprised and started to tell myself “I have had enough of that bhajan. Why is He boring me with the same bhajan?” I turned and looked at Him; my face was a question mark. He said, “You are wondering why I am singing the same bhajan, right? I am singing this again and again because it has the essence of knowledge. If you can assimilate that knowledge, there is nothing more you would need to do. You would have attained your spiritual goal.” Till then, I had not realized that I had not paid attention to the meaning of the bhajan. Then he says, “Mother, father, children, relatives, etc. are only your own imagination, kalpana. Whole creation is only imagination; it is a projection of your mind which doesn't really exist. It is delusion. All relationships exist, but only relatively real, not in absolute terms. You are only playing a role.” Kalpana means you imagine a role and play it. It is not true. It further goes, “You will have to leave your kith and kin. Jhooti jagath, kalpana saari, aakhir yah jag sapna rey! In the end it is only a dream.” The end doesn't mean one is going to realize it after death. That took me a while to understand. He said, “You will awaken from that day dream when you realize life is a dream.” Dream is not always available; when you wake up the dream is no more. Similarly, when we awaken to our true self, the dream ceases to be. Swami says, “Awaken to your true self, the world which is bothering you, will cease to exist”. It took me quite sometime to completely understand this song. Now, I repeat this song wherever I am asked to talk. This is the essence of what Swami taught me 2-3 years after I arrived at Puttaparthi. I came here in 1950. So it has been more than a half-century. This song I must have sung in 1954 or so. So, it has taken me lot of sadhana (spiritual effort) to go inward and really understand it completely. Problem, according to me and not Him. Let us remember, Swami has no problem! Crisis is our making and we have to solve it. Bhagavad Gita says, “You are the cause of the problem and you must find a way out of it, no one else will, not even the Guru. I used to go to Delhi often and stay with my elder sister, Kamala Sarathi, during the holidays. 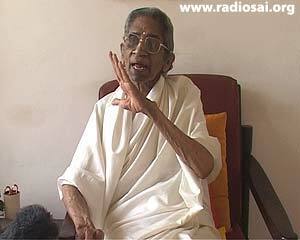 She lived in the vicinity of the Ramakrishna Math. After the first visit, Swami told us to be in satsang (good company) and we asked Him as to how could we do that. He told us to participate in Gita classes and similar activities. We asked Swami if we could continue to go to Ramakrishna Math. At that time, we thought Swami was a great person, but did not know that He is God Himself. So, we were not sure if He would approve. But Swami said, “Yes, it is a very good place, go to Ramakrishna Mission! Go and participate in all their study circles and talks.” They had regular Gita and Upanishad classes and we attended them sincerely. During some occasions like the Holy Mother's birthday or Sri Ramakrishna's birthday, they wanted a few good bhajan singers to sing on the stage in the presence of large audiences. So, my sister said, 'Rani Maa knows bhajans and if you would like her to sing, I will ask her”. Now, Swami is not in Delhi, how does He know? He is proving His omnipresence to us, He knows everything we do! We didn't know He is omnipresent. I thought He is omnipresent only when we pray! My understanding of His omnipresence was limited. I didn't know He was my inner self and was aware of every thought, word and deed during the whole day. He knows what I am up to. I can't do anything without Him knowing it. When you get that awareness, you will be very vigilant and careful. 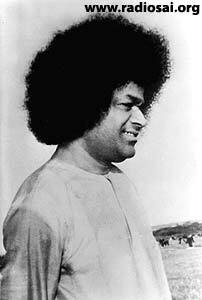 If you know Swami is aware of everything that you do, will you do many things you do in His physical absence? No, you will not. You will talk very politely even to individuals with whom you have disagreements. You will think, “Swami is watching, let me be polite”. It is this awareness He wanted us to develop. It has to be developed. It doesn't come easily. It is the torturous passage of the grain through the grinder. It is like climbing the Himalayas. So Swami said, “Ask her what she wants, if she wants name and fame, she can go and sing anywhere she likes. But if she wants to realize her true self she must stop going out, and sing only in the shrine of her home for God”. After I got this message I stopped going anywhere. One day, one Ms. Malini called me up and said that she wanted me to sing. I said, “Sorry, I don't have my Guru's permission.” But she said, “You are not singing for public, only for nuns.” I said I didn’t know if I could or not and that I have to pray to Swami and think about it. She insisted that I should. I thought about it and prayed. Something told me that ‘since it was for nuns, I could, but no more after this. I should make it clear’. He told me once: “I don't guide everyone, I do it only for those who ask for it. In your case, you ask me for guidance in everything, small to big (I even ask Him very mundane things related to this maya existence, shall I cook this or that, etc. ), so I will interfere in everything and guide you.” I was momentarily hurt as to why He stopped me from singing. After all, I was singing only bhajans, not even classical numbers. I stopped that long ago. I remembered Thyagaraja, when he was invited to the court to sing, he said he sang only for the Lord. I didn't understand Swami then. I thought it was not as if I was giving radio programs. But then when I thought deeper I realized that I must live only for God. One has to renounce things that belong to the realm of ‘I’ and ‘mine’. I went there because the nuns had assembled and Swami had asked me to keep attending satsang at the Ramakrishna math. Ramakrishna and Sharada maths have given us so much, and so, I owed it to them. Therefore, with that attitude, not knowing whether it was obedience or not, I went. I felt the decision was consistent with dharma. It was not for publicity. It was not for name or fame. After this event, I completely stopped. I don't sing till date when I go out. Swami is constantly keeping track because we are asking Him for guidance. We were in the Old Mandir. When the quarters got ready, Swami was allotting quarters to all permanent residents who were helping in His mission. But we were only occasional visitors. At this time He was personally allotting rooms! We had to inform Him when we arrived and He would allot accommodation based on the availability. Very few quarters were available and especially during functions He used to put us together with some family or the other. About eight or ten of us used to live in a small room. We had to accommodate each other and share everything. Prior to these rooms being available, it was even more difficult. He passed us through various stages of learning to adjust. Can you limit your needs to the situation? This is the demand for spiritual evolution. We never grumbled because He gave us the strength, acceptance and happiness. We were not at all sad inside. Now I ask myself “What is it that allowed us to undergo all that joyfully? On one occasion, we had to leave Puttaparthi in a couple of days; those days we had to inform Swami when were leaving. This was during Dasara and Swami used to stop all interviews a month before Dasara as He used to get involved in the organisation of the festival Himself. Devotees used to come forward to help, but it was all under His direct supervision. So He couldn't give interviews at that time. I had to go to the General Hospital which was very small at that time. “She can come with her younger sister.” So we went to the Hospital quietly and waited on the appointed day. He came directly to us and took us into the surgical room. I don't remember the entire conversation we had, but I do remember this much. I asked Him something that had been bothering me. Never think “I cannot accomplish this task”. When you think so, you come crashing down to the body level. The 'I ' is ego. There is no 'I'. There is only He. Swami is doing it from within us. It is my experience that whenever I have thought that I need to solve a problem, it never worked. But when I leave the problem to Him saying, “You are the doer and I am only an instrument”, then everything starts working fine. I have not yet reached that highest state of realization. 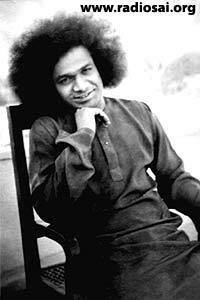 Swami has put the thought in my mind that every place is God's and therefore I did not grumble. But there was one thing that He did promise me. “Whenever you come here, I will see to it that your stay here is not hindered by any external problem”. Once He put us in a garage. There was Swami's car behind which there was Shirdi Baba's Ratham (chariot) which left only the four corners of the garage empty. We used to cook in one corner and sleep in the other. We didn't feel bad about it. We managed everything without feeling sorry for ourselves. I have to thank Swami for this. He has given us that power of acceptance and the joy therein. He has demonstrated to us that this acceptance has to come from within and that He has been instrumental in making this happen. He gave us the power of acceptance because we had gone there for His sake and He wanted to give us peace. He did not give us external peace. We were accommodative with every hardship we encountered, but He gave us internal peace in abundance. Now, when I think of those days and remember how happy I was even after accommodating all those hardships, I realize that He did all this for me. If you live for Him, He will take care of everything - your thought, word and deed. If you are finding it difficult, tell Him, ‘Swami, I am finding it very difficult.’ He will surely help you. If someone rebukes you for no reason you should not retaliate. You should suffer the hurt internally and keep calm externally. “Silence is the language of the spiritual seeker”. We are all seekers. Devotee means 'Bhakta'. That is why Swami does not address us as Bhaktas (devotees). He told us once that He addresses us as “Atma Swaroopulaara” (embodiment of divine Atma) because, not one in this congregation can be called a devotee. However, each one here is an Atma Swaroopa (embodiment of the spirit) although they may not know that truth. They cannot be called devotees because they have not imbibed the qualities of a devotee as listed in chapter XII of the Bhagavad Gita which says: “One who has transcended the pairs of opposites, and has recognized the true nature of the world (that it is temporary)”. Swami, therefore says, “Don't talk”. We shouldn't even talk about others. Years ago, He had said that you have come here only to focus on yourself. You should not be worried about how someone else is behaving. They are all my children and each one has started their own pilgrimage. Some are spiritually advanced; others are still going through the process of development. They are rude because they are stressed, poor things! They are all struggling to maintain their equanimity. Therefore, in a moment of anger, they might behave rudely; sometimes some volunteers might behave unkindly. They do so because if they speak calmly and lovingly, no one listens to them. Thus, it is necessary for them to behave in such a manner to maintain the discipline of the place. However, one should not worry about why someone has been rude, it is not one's business to do so. It should be clear that it is all delusion. Asatoma Sadgamaya, what does this mean? It means, “Lead us from the unreal to the real.” We chant this mantra everyday, but do we understand its meaning? Mere chanting is of no use. We should apply it in our daily life. Applying the teachings of these chants in our daily life is very difficult. It can only be achieved by a few people. Those who are sincere and want nothing but God are the only people who have practiced all these teachings in their daily lives. It is very difficult to imbibe the teachings of the Guru but Swami once told us, if you feel it is very difficult, it means that you are progressing fast. The Guru subjects us to so many trials so that we come near our goal. It is like nearing the sea. As you approach the sea, you hear the roar of its waves getting louder. Therefore, if you want God, submit yourself to the tests that He puts you to happily. Otherwise, if you want to enjoy the world, be honest and say so to Swami.